Höegh LNG contracted CSA Ocean Sciences Inc. (CSA) to provide a feasibility study; perform habitat characterization field surveys; and compile and prepare license applications and permit applications to construct, own, and operate the Port Dolphin deepwater port (DWP) off the coast of Tampa Bay, Florida. One license application was prepared pursuant to the Deepwater Port Act of 1974, as amended, and U.S. Coast Guard (USCG) regulations, 33 C.F.R. Part 148 (2006); the second license application was prepared pursuant to the Natural Gas Act regulations 18 C.F.R. Part 380 and Federal Energy Regulatory Commission (FERC) requirements. The unloading portion of the deepwater port will be located in Federal waters approximately 28 mi (45 km) offshore the Tampa Bay area in approximately 100 ft (30 m) of water. The Port Dolphin DWP will consist of two mooring buoy systems capable of simultaneously offloading two shuttle and regasification vessels. The natural gas will be offloaded by means of 16-in. flexible risers from each buoy down to two 36-in. subsea flowlines through a piggable-Y to a 36-in. gas transmission line. 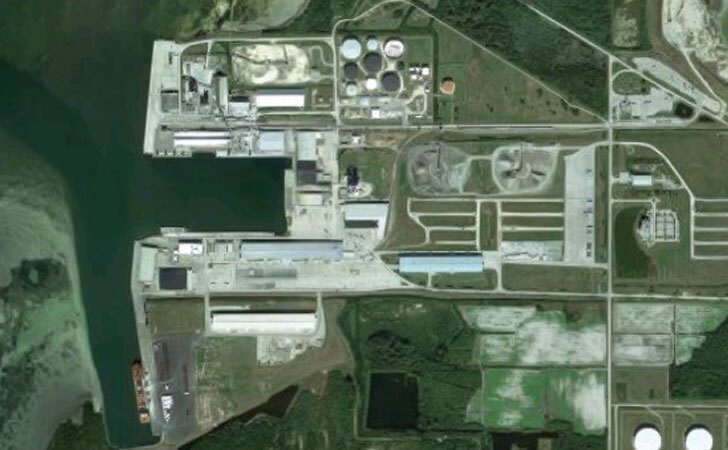 The gas transmission line will transport natural gas to a shore facility for interconnection with existing infrastructure located approximately 3.9 mi (5.7 km) inland in Manatee County, Florida. CSA prepared a feasibility study using exclusionary mapping (utilizing Geographic Information Systems [GIS]) to identify an appropriate location for the DWP examining commercial and environmental needs and constraints. After the feasibility study was complete, CSA was responsible for collecting, analyzing, and documenting all the biological environmental data used in developing the environmental permitting documentation in accordance with requirements of the Department of Transportation, USCG, Minerals Management Service, U.S. Environmental Protection Agency, State of Florida, the United States Army Corps of Engineers, the National Environmental Policy Act, Deepwater Port Act, Homeland Security Act, Natural Gas Act, and other regulations. Resource characterizations of the buoy area and pipeline corridor were conducted with towed video/still camera systems and diver surveys. As part of the development of the permitting documentation, CSA prepared the marine and terrestrial environmental sections of the USCG and FERC application documents as well as an Essential Fish Habitat assessment as required by Final Rule provisions of the Magnuson Stevens Fishery Conservation and Management Act. In addition, CSA was responsible for the management and coordination for the turbidity modeling analysis to determine impacts to benthic resources and water quality from pipeline installation and operations as well as an acoustic modeling analysis to determine impacts to marine mammals and sea turtles. CSA was also responsible for preparing all Federal and State permit applications, including Section 10/404, National Pollutant Discharge Effluent System, Prevention of Significant Deterioration Air permit, and Florida Environmental Resource Permit. CSA services include coordination and negotiations with State and Federal regulatory agencies (Florida Department of Environmental Protection, U.S. Army Corps of Engineers, USCG, National Marine Fisheries Service, Florida Fish and Wildlife Conservation Commission, and U.S. Fish and Wildlife Service).